The euro has fallen against the dollar. The news plan to show the October activity index evaluation in the Eurozone service sector (PMI) and the composite indicator that takes into account the manufacturing and service sectors. We do not expect the changes in the preliminary values that will likely be 52.4 in the service sector and 52.2 according to the composite index. The September retail sales results are disappointing for the euro as it is expected the fall by 1.0% m/m, after + 1.2% m/m in August. The euro/dollar showed a new decrease. The pair traded in the narrow range the whole European session, but it rose to the level of 1.2580-1.2600 at the US session, and then rebounded below the local support level of 1.2480-1.2500. The downtrend is still in force, so the support level of 1.2405-1.2425 testing is possible in the short term. The pound/dollar tried to decrease but rebounded upwards. The October retail prices index publication by BRC gave the first occasion for a disappointment on the "cable" showing the fall by 1.9% y/y after -1.8% y/y in September when it was expected some increase to -1.7% y/y. The service sector PMI that is the dominant sector in the British economy is expected with the slowdown in October - up to 58.5 vs. 58.7. The pound/dollar leaves no attempts for a recovery development, but the growth to 1.6040-1.6060 continues to attract sellers. The pair was again in sale whereby the pair fell to 1.5940-1.5960. 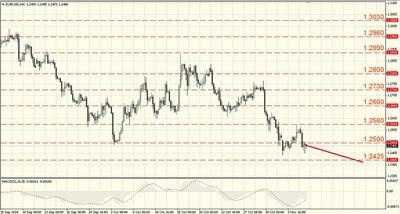 The support levels are 1.5940 - 1.5960, and the resistance levels are 1.6040 - 1.6060. The support level of 1.5850-1.5870 new testing risks are high. The latter level breakthrough will open the way to new minimums. The growth above 1.6040-1.6060 will weaken the downward pressure. The US dollar strengthened against the Japanese yen. The Japanese economic data publication showed mixed results - the monetary base is fixed with positive dynamics of 36.9% y/y vs. 35.3% y/y in October, but the business activity index in the services sector in the same month is negative as the activity was in the zone recession below 50.0, showing 48.7 after 52.5 in September. The pause in an uptrend was short within the dollar/yen. After the slight pair decline to support around 113.10-113.30 that took place in the framework of consolidation after the pair rise, the dollar resumed its growth and broke through the highs at the level of 114.20-114.40 and is currently trading above it. The support levels: 114.20-114.40, and the resistance levels: 115.25-115.45. The dollar could rise in the short term to the 115th figure. The loss of support around 113.10-113.30 will lead to the fall towards 112.40-112.60. Join in and write your own page! It's easy to do. How? Simply click here to return to Technical analysis articles.